Tecnofluss is specialized in the manufacturing of filling machines and complete lines for filling and capping of liquid, semi-liquid, dense and doughy products in food, chemical, cosmetic and pharmaceutical industries. Filling units are made in several models depending on the product to be dosed. Manufacturing in PVC for acid products or in stainless steel AISI316 for food, cosmetic and pharmaceutical products. We have different dosing systems for every product requirement, for ex. : volumetric – pneumatic, volumetric driven by brushless motors with balls recycle screw, systems easy to clean with magnetic mass device. Our systems are quick, precise and user-friendly. We manufacture systems on specific customer’s request basing on output, kind of product to be dosed and container. These units are very flexible for processing several container formats. They can be equipped with loading and accumulation tables. Format change is quick and easy. The filling unit can have one, two or four dosing nozzles basing on the production required. It is possible to place downstream a capper and a labeller or marker. Our lines are designed for reaching the maximum efficiency with several formats. The linear monoblock for filling is used in the chemical industry and it is suitable for acid products, foaming detergents and bleach. It is built with a frame in stainless steel, covered with PVC panels and it can dose several formats of containers. 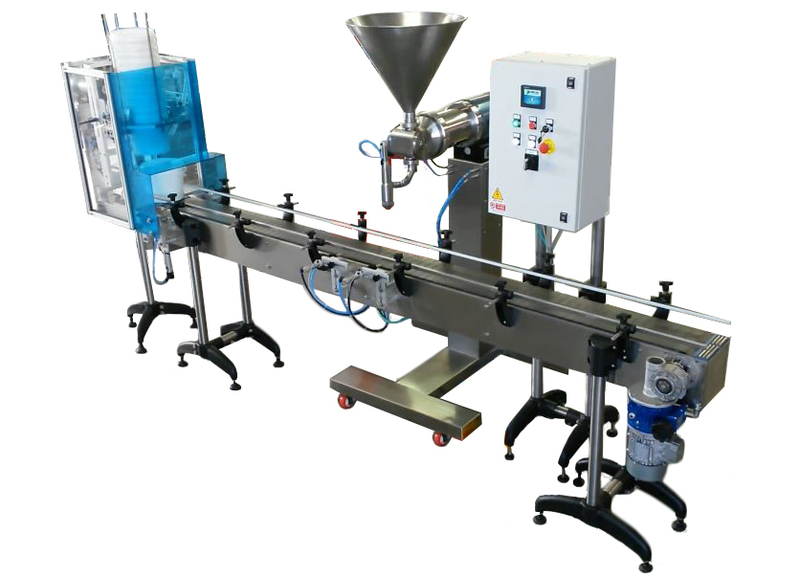 Dosing can be effected on a conveyor belt by a centering auger filler or by pneumatic stoppers. Dosing foresees from 6 to 12 heads for output from 2000 bottles/h in 1 liter format (6 heads) to 350 tanks/hour in 5000 ml format. The rotary monoblock for filling is used in the chemical industry and it is suitable for acid products, foaming detergents and bleach. It is built with a frame in stainless steel, covered with PVC panels and it can dose several formats of containers. 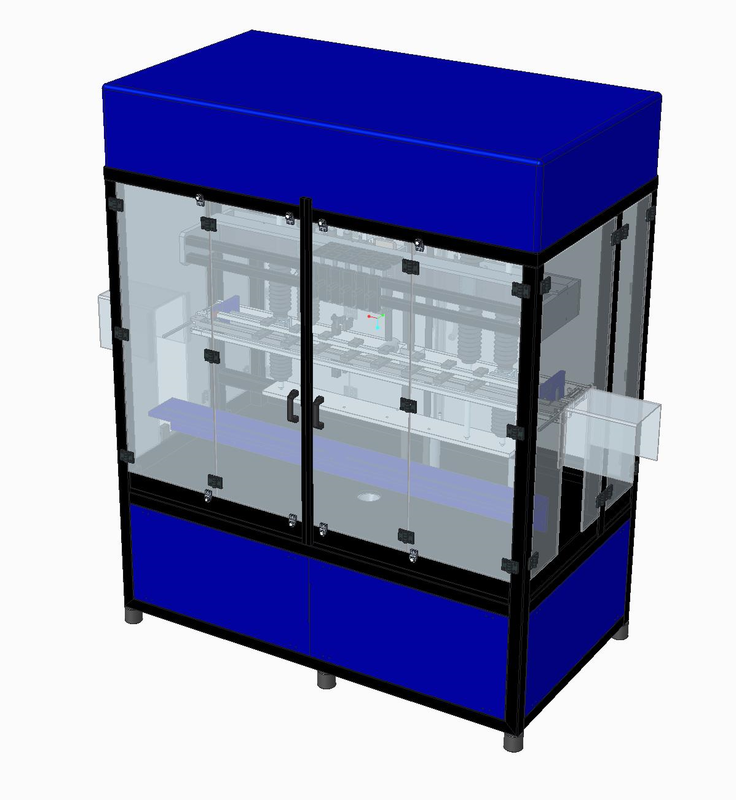 Dosing can be effected on a rotary star with heads in quantity from 12 to 36, for output from 6000 bottles/h in 1 liter format to 8500 bottles/h in 200 ml format. The magnetic mass monoblocs MR-4 for filling are made in 4 basic models: MR-4 MR-6 MR-8 MR-10. Particularly suitable for products that are difficult to treat. Easy and fast cleaning of the parts in contact with the product. They can dose different sizes of containers, from 10 ml to 5 liters. They are used in cosmetics for creams, lotions and shampoo-type liquids, etc. Or in the chemical-food-pharmaceutical industry for outputs from 2000 to 6000 pieces per hour. 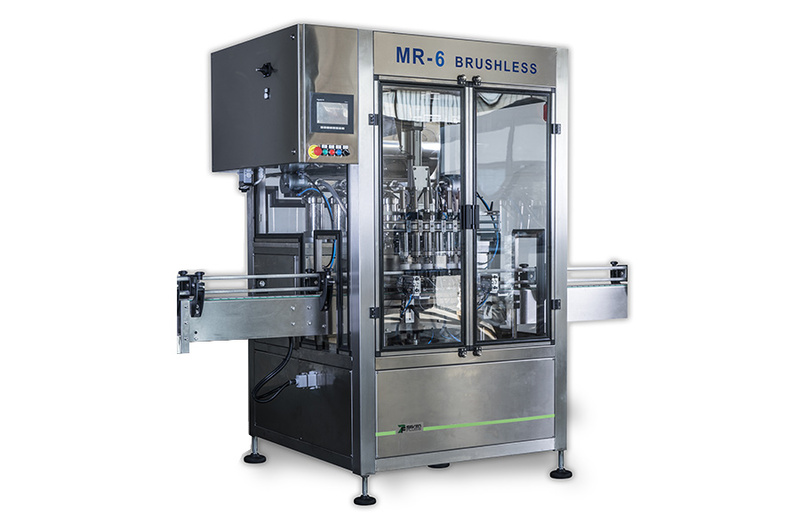 The brushless filling units MR-6 are made in 4 basic models: MR-4 MR-6 MR-8 MR-10. They can dose different sizes of containers, from 10 ml to 5 liters. They are used in cosmetics for creams, lotions and shampoo-type liquids, etc. Or in the chemical-food-pharmaceutical industry for outputs from 2000 to 6000 pieces per hour. 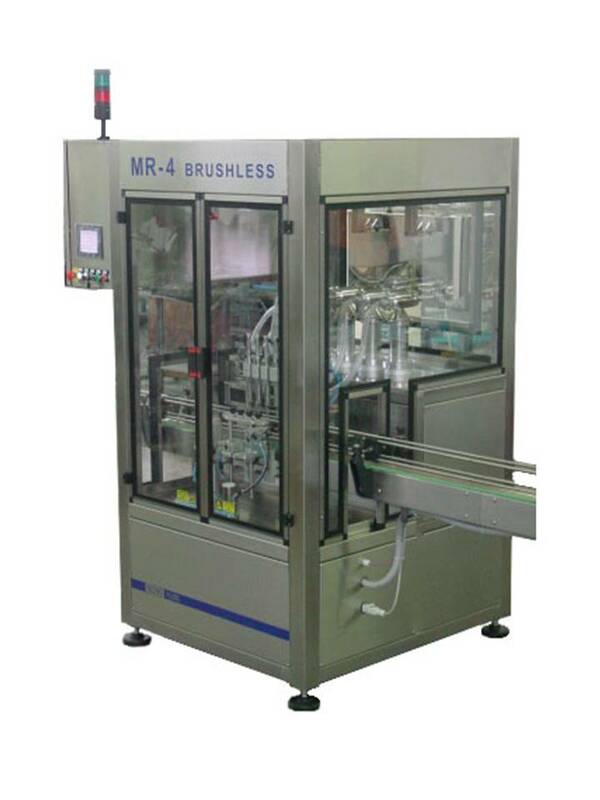 The filling units MR4 with pneumatic dosing machine are made in 4 basic models: MR-1 MR-2 MR-4 MR-6. They can dose different sizes of containers, from 10 ml to 5 liters. They are used in cosmetics for creams, lotions and shampoo-type liquids, etc. Or in the chemical-food-pharmaceutical industry for outputs from 1500 to 5000 pieces per hour. The ND 2000 series dosing belts are suitable for the automatic dosing of various liquid, semi-liquid or doughy products. The structure is in stainless steel with an acetal chain or in stainless steel. The motor can be controlled by a speed variator or an inverter. 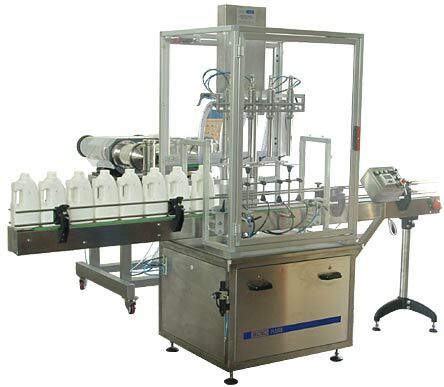 The dosing station is composed by pneumatic cylinders for stop containers with photocell.The VM model dosing machine is mounted on a height adjustable support to allow the format change of the product container. The electrical equipment is controlled by a PLC and the push-button panel enables an easy use of the whole system. REMARK: Loading and accumulation tables can be installed. The NDS 2000 series dosing belts are suitable for the automatic dosing of various liquid, semi-liquid or pasty products. Suitable for the dosing of stackable containers on a conveyor belt for containers from 1 to 5 lt. 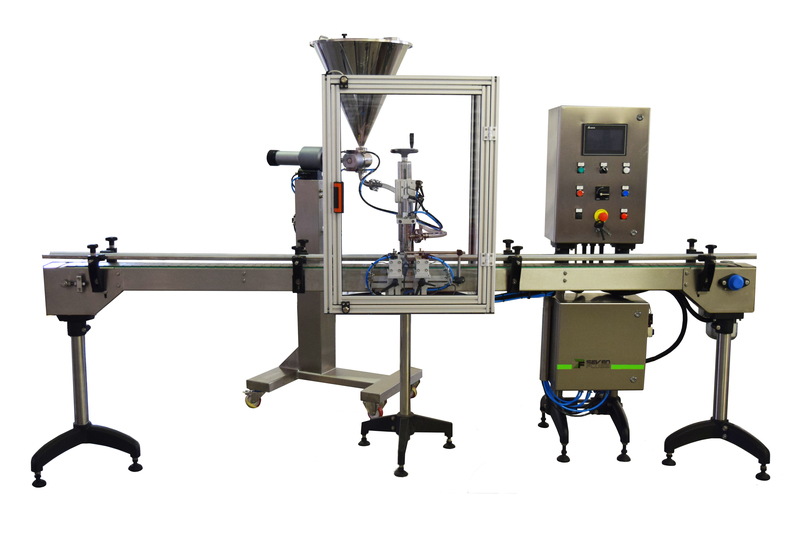 The dosing station is composed of pneumatic cylinders for stopping containers with a photocell control. 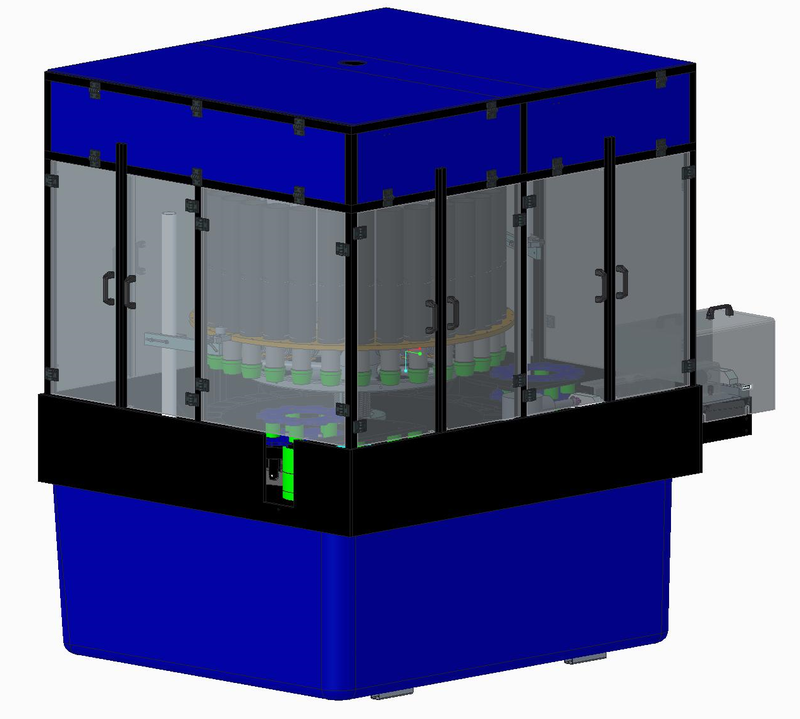 The VM model dosing machine is mounted on a height adjustable support, to allow the format change of the product container. The electrical equipment is controlled by a PLC and the panel with push-button panel allows easy use of the entire system.